Models involved are Peugeot 308, 3008, and RCZ vehicles manufactured between March 2010 to October 2010. In some instances the fuel return pipe might wear through and cause a leak due to contact between the fuel return pipe and the fuel filter support bracket. Models involved are 307 308 and Expert. Following an earlier software upgrade a further upgrade needs to be performed in order to rectify a light switch malfunction. The official public notice by Peugeot Australia can be found on the Australian Competition & Consumer Commission (ACCC) web site. It has come to our attention that a small number of Peugeot 407 vehicles have been recalled for remedial action. Problems with the front lights may occur due to a wiring harness contacting the cooling fan. The official public notice by Peugeot Australia can be found on the Australian Competition & Consumer Commission (ACCC) web site. Owners of vehicles involved in a safety recall are usually notified by their Peugeot Dealer. Furthermore, recalls will always be announced in a public media like a newspaper or web site. In Australia the best place to look for product recalls is the ACCC web site. They also have a list with vehicle identification numbers of involved vehicles. There you will find Peugeot recalls dating back to 1991, which by the way concerns the 405 Mi16. If you are unsure whether a recall exists for your car, go to the ACCC web site Australia only or better, contact a Peugeot Dealer. They can quickly determine whether your vehicle is listed for any remedial work under the recall scheme. You will have to provide the VIN for identification of your vehicle. There appears to be widespread misapprehension about causes of engine pinging. Read about myths and facts of engine pinging here. Use the menu below to locate fuse appliction charts for some of the earlier models. On latter model Peugeots the fuse application can be found in the owner's manual. Look under the bonnet of various Peugeot models. The Independent Technical Information Site For Peugeot Owners! The purpose of this website is to provide technical information to Peugeot owners and professional repairers. We welcome visitors from all over the world and invite you to contact us with questions or to make contributions. We would like to encourage everyone to browse the workshop and FAQ section before posting questions. Get instant traffic by purchasing this domain. Up to 1000 visitors per day. More info here . .
existence in their workshop, digging in the dark for solutions to difficult problems. an insignificant idea that resulted in this little insignificant web site. training and workshop repair manuals. I believe also the the name of the brand. I hope by saying this we did not break any French or international laws. Do you have a problem with your Peugeot that nobody has been able to solve? Have you been left in the dark by your repairer. Search this site for information on your car problem first, and if you are unsuccessful you can contact us with a detailed description of the issue. We will then try to find a possible solution for you. It's free and you will get a reply but no guarantee. We are happy to share what we know but we don't apologise for what we don't know. Engine Oil, mineral, synthetic or semi-synthetic? What oil should I put in my Peugeot engine? PEUGEOT 905 powered by a 700hp 3.5 litre V10 engine. In 1992 this powerful Lion came in first and third place at the Le Mans 24h and it took place one, two and three in 1993. Learn more about Peugeot's past involvement in Le Mans 24 hours racing. The first Le Mans endurance race was held in 1923, Peugeot first entered the 24 hours race in 1926. Find the Le Mans history time line on the . 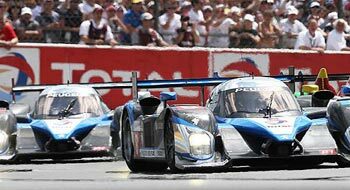 . .
Peugeot returns to Le Mans in 2007. After a long break in endurance racing Peugeot returns with the 908 HDi FAP, 5.5L, 100° V12 >700 hp engine. In 2009 the Lion takes Place 1 and 2 in Le Mans 24 hours. 18. January 2012, Peugeot announced its withdrawal from Le Mans racing. It is very disappointing that we don't get to see the new Peugeot 908 HY Hybrid perform. Hopefully sometime in the future there will be a new announcement in this spot informing us of Peugeot’s return to Le Mans. The DAM number represents the exact date of manufacture for a Peugeot and can be found on vehicles built on or after The 1.January 1993 with the number 5898. In the parts department this number is sometimes needed to differenciate between daily production variations. The VIN allone does not alaways point to the correct part number. The calculator is a MS Excel spreadhseet. Don't worry, it's not a list with a million numbers. You enter the DAM and a clever little built in formula calculates the exact build date of your Peugeot. We receive large numbers of enquiries with regards to the anti pollution fault. This usually means a warning saying - Anti Pollution System faulty - is showing on the display. Quite often the engine warning light illuminates at the same time. It is also possible there are no noticable symptons. In short, this warning indicates the presence of a fault, either in the engine management system or the transmission mangagement system, that affects the vehicle's emissions. Any malfunction like a slight misfire, fuel mixture too rich or lean over a priod of time, or even a problem in the transmission can trigger this warning. - DO NOT ASK PEUGEOTLOGIC WHY THIS IS HAPPENING - If you don't wish or can't go to a Peugeot Service Centre then you can go to a independent workshop as long as they have a suitable diagnostic scan tool. A scan of all the systems will soon point in the directon of the problem. The cause can be in the transmission or then engine management system, more often in the engine side. Reading the diagnostic trouble codes (DTC) is always the essential first step of a diagnostic procedure and will often lead to a quick resolution. However a resolution is not always instantanious and further testing may be required. The onboard diagnostic system can never give an absolute answer, it will point the technician in the direction and he has hopefully the experience and the skills to drill down to the root of the problem.